This a page within the www.staffshomeguard.co.uk website. To see full contents, go to SITE MAP. The following picture was among a group of family photographs and memorabilia dating mainly from the World War II period. The collection also included two World War I medals and cap badges from the Middlesex Regiment, the Essex Regiment and the Upper Thames Patrol. his brother Mortimer Charles Jenkins - his father, Charles William Jenkins. Mortimer Jenkins was serving with the Royal Army Ordnance Corps, while William Jenkins was a sergeant in the Middlesex Home Guard. His medals reflect World War I service with the Essex Regiment – four or five ribbons being visible, including the War 1914-18 Star, War Medal, Victory Medal and possibly the Territorial War Medal. 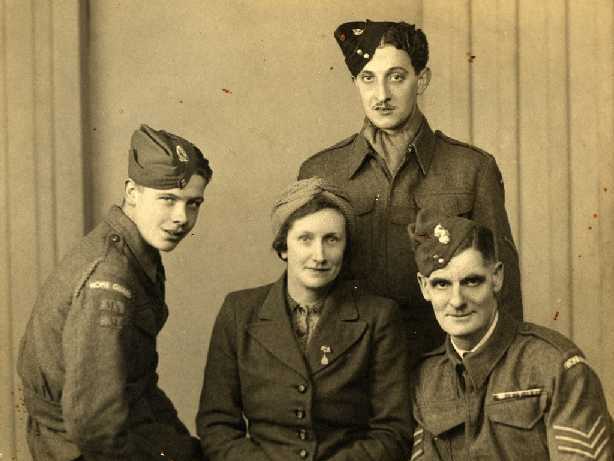 Sergeant Jenkins appears to be wearing a grenade cap badge, whereas Stanley Edgar Jenkins is apparently wearing the badge of the Upper Thames Patrol (see below left). 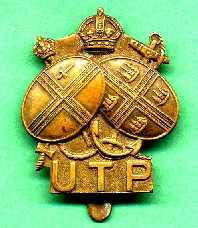 His shoulder title and patches reveal the words “HOME GUARD” and “MX”, together with the numerals “31” – the latter being consistent with membership of the UTP. The Upper Thames Patrol was a somewhat obscure World War II unit which was, in effect, a sort of floating Home Guard, its members being responsible for the defence and security of the River Thames between London and Lechlade in the counties of Surrey, Middlesex, Oxfordshire, Buckinghamshire and Berkshire. The Upper Thames Patrol had been the idea of Sir Ralph Glyn, the Member of Parliament for Abingdon, who had approached the War Office and was granted permission to form a waterborne unit to patrol the River Thames between Teddington and Lechlade. The unit was incorporated into the Local Defence Volunteers, and, as such, it became part of the Home Guard when that force was created. Sadly, Stanley Edgar Jenkins was killed in an air raid on his home at 8, Viola Avenue, Ashford, Middlesex on 23rd February 1944 when a string of bombs fell on Viola Avenue, causing fatalities at Nos. 8, 14, 16 and 25. He had been standing at his bedroom window and was caught by the blast, death being instantaneous; he was 17 years old. Some of the neighbouring houses received direct hits - including No.14, where the victims included 35-year-old Frederick Henry Holt, another member of the local Home Guard, together with his wife Dorothy, aged 25, and son Clifford, aged 21 months. Although Frederick was found alive amid the wreckage, he died a few hours later at Staines County Hospital. Most of those killed in the February 1944 raid are buried in Ashford cemetery. The names of all four of the above victims are inscribed on the war memorial at nearby Stanwell although, regrettably, Stanley Jenkins and Frederick Holt are not listed as members of the Home Guard. We are most grateful to Stanley C. Jenkins of Oxfordshire. the nephew of Stanley Edgar Jenkins, for these glimpses of the Middlesex Home Guard and and his permission for us to reproduce them here.